My staff and I are here to support management and the Board of Trustees in the effective performance of their duties and responsibilities and the attainment of their goals and objectives. We stay in touch with campus activities by participating on standing committees and other University functions. Our support may come in the form of a consulting or audit engagement. We work with management, faculty, staff and students to help ensure that the University’s assets are effectively utilized and appropriately safeguarded. Our engagements may evaluate financial, operational or compliance items within a department or area. Please refer to the PDF version of our office brochure for more details of the services we offer. When concerns of impropriety come to our attention, we perform special investigations and, if necessary, coordinate our work with law enforcement. We rely not only on our observations during routine audits, but also on information provided to us by concerned citizens. 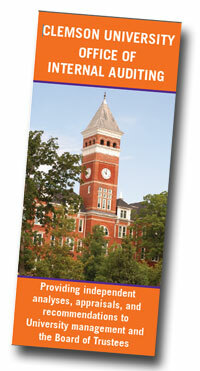 If you believe there are issues of potential fraud, waste or abuse of University resources, we encourage you to call one of our staff members or our confidential Ethics/Safety Hotline at (877) 503-7283 or lighthouse-services.com/clemson. Feel free to contact us if we can be of service to you.